A low pressure system is expected to continue to bring rain and wind to our region Sunday. High tide will occur on the back bays at 8:16am Sunday, and again at 8:35pm Sunday. During the evening high tide, some street flooding is anticipated. At times, the road to the Townsend’s Inlet Bridge may be closed by police due to safety reasons. The Bridge will be closed for the fall and winter on September 17thdue to construction. Never attempt to drive on any flooded street or through any flooded intersection as this puts you and your vehicle at risk, and may cause an unnecessary wake that can damage property. If you have any emergency, dial 911. Further advisories, watches, and warnings are likely to be issued by the National Weather Service throughout the week. The Service and the Stone Harbor Office of Emergency Management continue to pay attention to Florence which has the potential to impact the eastern seaboard of the United States later in the week. 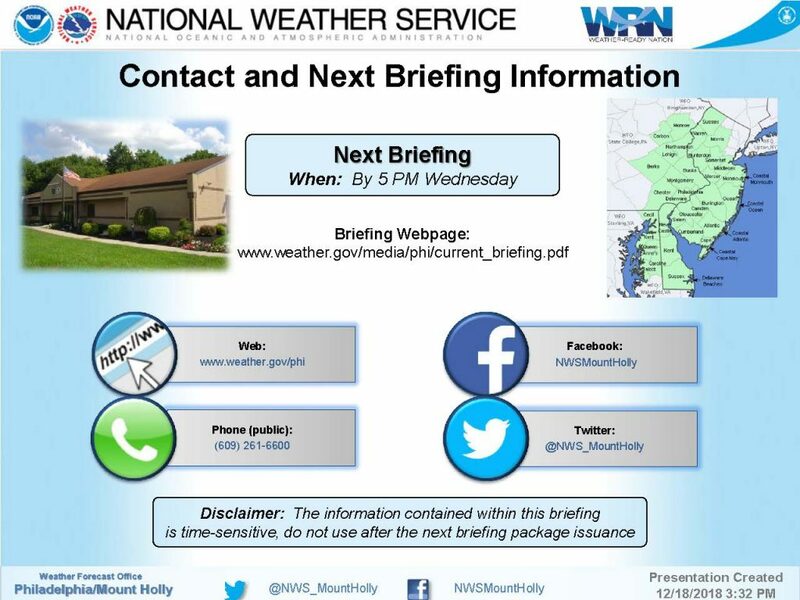 Continue to monitor the forecast on traditional media outlets. 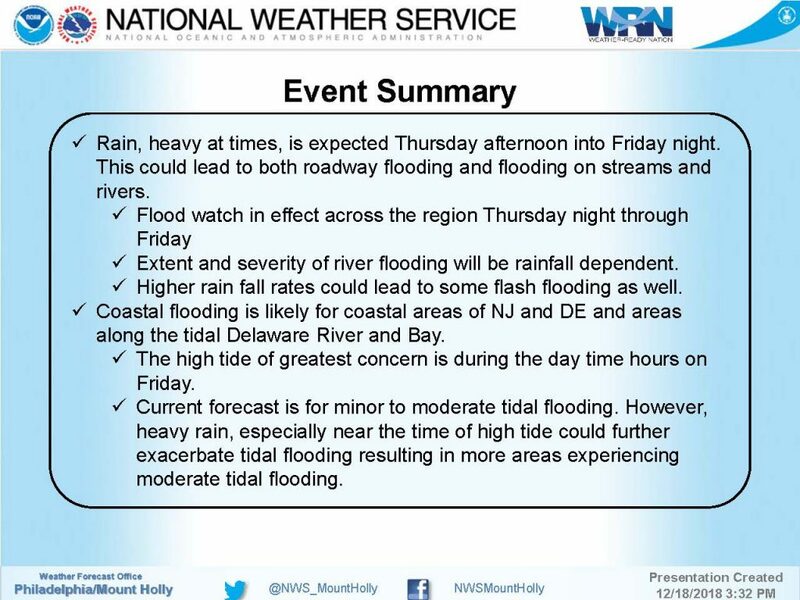 The National Weather Service in Mount Holly has issued a Coastal Flood Watch, which is in effect from Monday morning through Monday afternoon. * LOCATIONS…Coastal areas of eastern Monmouth, coastal Atlantic, coastal Ocean, and Atlantic coastal Cape May. This includes the beaches along the Atlantic coast of New Jersey and Delaware. * TIMING…High tide occurs between 7:00 pm and 9:00 pm tonight, and then high tide occurs between 7:00 am and 9:00 am Monday morning. Spotty minor coastal flooding is possible with the high tide this morning. The high risk for rip currents may need to be extended through early next week. * COASTAL FLOOD IMPACTS…One to two feet of saltwater inundation above ground level is possible in low-lying areas near shorelines and tidal waterways. At this level, widespread flooding of roadways is expected with many roads becoming impassable. Lives may be at risk when people put themselves in harm`s way. Some damage to vulnerable structures may begin to occur. At this level, widespread flooding of roadways is expected with many roads becoming impassable. Lives may be at risk when people put themselves in harm`s way. Some damage to vulnerable structures may begin to occur. Minor roadway flooding is possible on Long Beach Island, Seaside Heights, Point Pleasant Beach and other locations near Barnegat Bay. Widespread flooding of roadways is expected with many roads becoming impassable. Lives may be at risk when people put themselves in harm`s way. Some damage to vulnerable structures may occur. * WAVES…Building to 5 to 8 feet in the surf zone. * SURF ZONE IMPACTS…6 to 7 foot breaking waves will be dangerous to anyone who enters the surf. Very strong rip currents will be life threatening to anyone who enters the surf. The National Weather Service has issued a Coastal Flood Warning for the Borough of Stone Harbor for Saturday evening, September 8th. The Warning is in effect in advance of high tide which will occur at the Townsend’s Inlet Bridge at 7:45pm. Salt water inundation is possible at time of high tide which will cause some street flooding in low lying areas. This is expected to be the first of various flood advisories, watches, and warnings that may be issued this week along the Jersey Shore. Please exercise caution while driving. Never attempt to drive on any flooded street or through any flooded intersection as this puts you and your vehicle at risk, and may cause a wake that can damage property. If you have any emergency, dial 911. Be advised that the roadway leading to the Townsend’s Inlet Bridge was closed late afternoon by Avalon Police due to unsafe travel conditions. The Bridge itself will be closed for the duration of the fall and winter months, starting September 17th, 2018. The National Weather Service has also issued a High Surf Advisory from Sunday morning through Monday morning. A Coastal Flood Watch is in effect from Sunday evening through late Sunday night. There is a high risk for rip currents in the ocean. The National Weather Service in Mount Holly has issued a Coastal Flood Warning, which is in effect until 11 PM EDT this evening. A High Surf Advisory has also been issued. This High Surf Advisory is in effect from 11 AM Sunday to 6 AM EDT Monday. In addition, a Coastal Flood Watch has been issued. This Coastal Flood Watch is in effect from Sunday evening through late Sunday night. The Coastal Flood Watch is no longer in effect. * LOCATIONS…Coastal portions of Atlantic and Cape May counties. 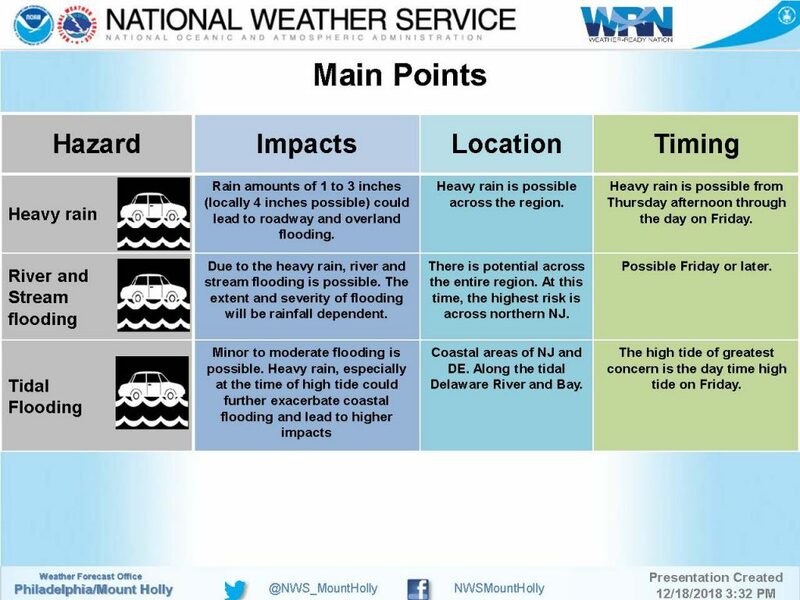 * TIMING…High tide occurs between 7:00 pm and 9:00 pm this evening. High tide on the back bays occurs later than the high tide on the oceanfront. There will be several rounds of coastal flooding beyond tonight. The high risk for rip currents may need to be extended through early next week. * COASTAL FLOOD IMPACTS…Two to three feet of saltwater inundation above ground level is possible in low-lying areas near shorelines and tidal waterways. 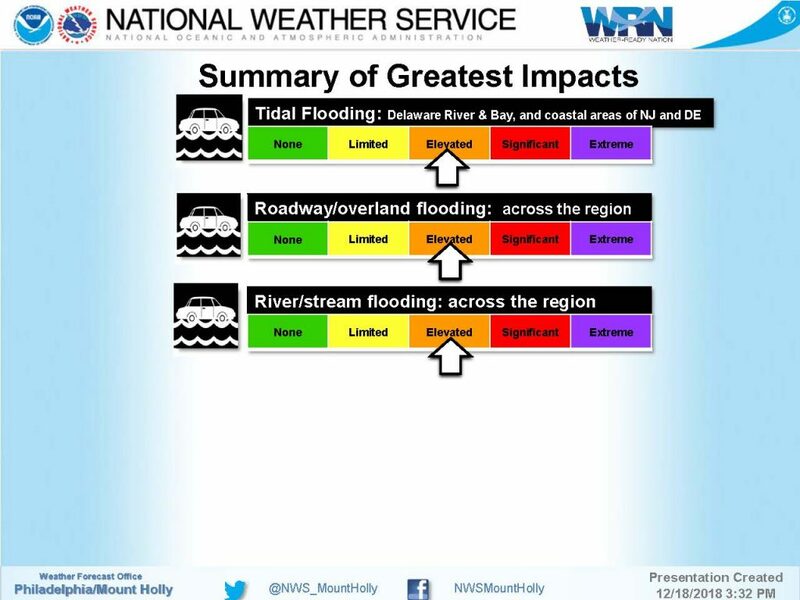 Flooding is expected to be severe enough to cause widespread flooding of roadways. Vulnerable homes and businesses may be damaged as water levels rise further. The flood waters are a danger to anyone who attempts to cross on foot or in a vehicle. * WAVES…Building to 6 to 8 feet. * RIP CURRENT RISK…High. * SURF ZONE IMPACTS…Up to 8 foot breaking waves will be dangerous to anyone who enters the surf. Very strong rip currents will be life threatening to anyone who enters the surf. 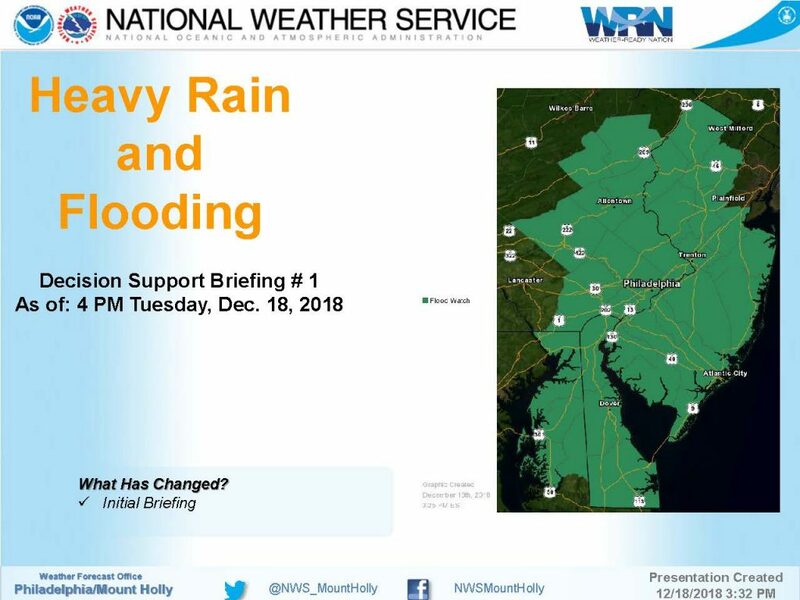 PRECAUTIONARY/PREPAREDNESS ACTIONS… A Coastal Flood Warning means that moderate or major tidal flooding is occurring or imminent. be prepared for rising water levels and take appropriate action to protect life and property. Follow the recommendations of local emergency management officials. Do not drive your vehicle through flood waters. The water may be deeper than you think it is. You will be putting yourself in danger and your vehicle may be damaged…leading to costly repairs. A High Surf Advisory means that high surf will affect beaches in the advisory area…producing localized beach erosion and dangerous swimming conditions. A Coastal Flood Watch means that conditions favorable for flooding are expected to develop. Be prepared to begin taking appropriate action to protect life and property. Follow the recommendations of local emergency management officials. Be sure to check the latest forecast from time to time in case a warning is issued or any new information becomes available. Visit the Advanced Hydrologic Prediction Service at water.weather.gov/ahps for additional water level and flood impact information for your local tide gauge. Swim near a lifeguard. If caught in a rip current, relax and float. Don`t swim against the current. If able, swim in a direction following the shoreline. If unable to escape, face the shore and call or wave for help. The National Weather Service has issued a Coastal Flood Watch for Stone Harbor and surrounding communities for this evening’s high tide event. The Watch is in effect on Saturday, September 8th, from 5:00pm through this evening. There is a potential for coastal flooding caused by a low pressure front that is expected to bring rain throughout the weekend; there is also a high risk for rip currents as a result of this front, and from Hurricane Florence which continues to move towards the United States in the Atlantic Ocean. There is the chance for repeated flood advisories and watches throughout the week as a result of these weather factors. High tide will occur at the Townsend’s Inlet Bridge at 7:45pm. Some street flooding may occur in the vicinity of high tide. Often during events like this the road to the bridge must be closed for safety reasons; as a reminder, the bridge will close for the winter for scheduled repairs on Monday, September 17th. Never attempt to drive on any street that is flooded as this puts you and your vehicle at risk. Driving on a flooded street also creates a wake that can damage private and public property. If you have any emergency, dial 911. 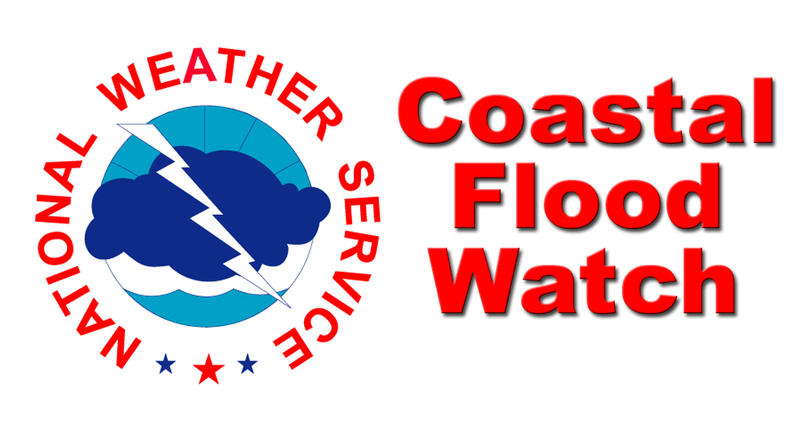 The National Weather Service in Mount Holly has issued a Coastal Flood Watch, which is in effect from 5 PM EDT this afternoon through this evening. * LOCATIONS…Coastal portions of Atlantic and Cape May counties. 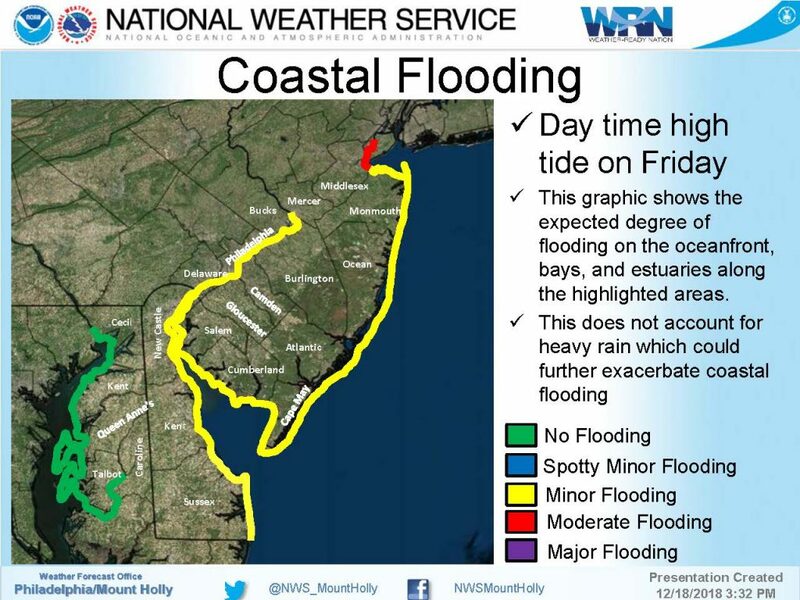 * TIMING…High tide occurs between 6:00 pm and 8:00 pm this evening. High tide on the back bays and on Raritan Bay occurs later than the high tide on the oceanfront. Coastal Flood Advisory and the high risk for rip currents are in effect through tonight. There will be several rounds of coastal flooding beyond tonight. The high risk for rip currents may need to be extended through early next week. * COASTAL FLOOD IMPACTS…One to two feet of saltwater inundation above ground level is possible in low-lying areas near shorelines and tidal waterways. At this level, widespread flooding of roadways is expected with many roads becoming impassable. Lives may be at risk when people put themselves in harm`s way. Some damage to vulnerable structures may begin to occur. * WAVES…Building to 4 to 7 feet in the surf zone. * TIDES…Low tide will occur in the early afternoon. High tide occurs this evening. SURF ZONE IMPACTS…Very strong rip currents will be life threatening to anyone who enters the surf. Subscribe to get Stone Harbor Emergency Updates! © 2019 Stone Harbor Emergency. All Rights Reserved.